"Canned baby clams and their juice are cooked with white wine, garlic, butter, and red pepper flakes to be served over linguine in this fast recipe." Bring a large pot of lightly salted water to a boil. Cook linguine at a boil until tender yet firm to the bite, about 11 minutes; drain. Heat oil in a stockpot over high heat. Saute garlic in hot oil until fragrant, about 1 minute. Stir red pepper flakes with the garlic; add white wine and reserved clam juice. Cook the mixture until the liquid reduces in volume by half, about 3 minutes. Drop butter into the liquid and cook until melted, 2 to 3 minutes; season with salt and pepper. Add clams to the pot; cook until he clams are heated through, 1 to 2 minutes. Stir linguine with the clam mixture to coat; season with parsley and oregano. 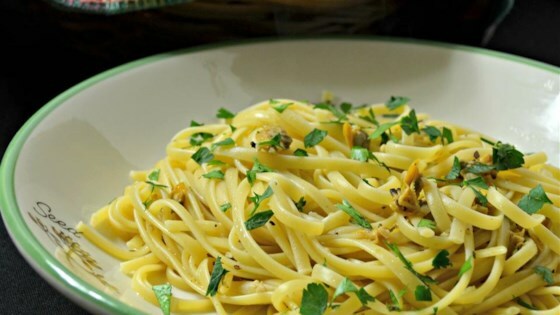 See how to make a light clam sauce with garlic, basil, and fresh parsley.